Coffee Cooling Invention a hit on Shark Tank! Dave Petrillo and Dave Jackson walked into Shark Tank to pitch their recent coffee cooling innovation. They asked for $150,000 for 5% equity of their company, making their company evaluation $3 million. Their invention is, Coffee Joulies, a stainless-steel bean filled with a “proprietary phase-change material” that instantly cools coffee to 140 degrees Fahrenheit and then keeps it at that temperature for hours. The Dave’s presented the Sharks with thermoses filled with coffee and Coffee Joulies. Three hours after it was first poured, the coffee was still steaming. In the end, the pair made a deal with Daymond, Kevin, Lori and Robert who offered $150,000 for a royalty agreement instead of equity. By accepting the offer, the pair agreed to pay the investors $3 on every wholesale unit sold and $6 on every retail unit sold until the $150,000 is paid back. 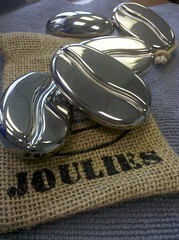 Coffee Joulies are sure to revolutionize the coffee business with the help of four Sharks. If you or anyone you know has an invention idea and needs help, please contact us at New Product Consulting. you writing this post and the rest of the site is also very good.